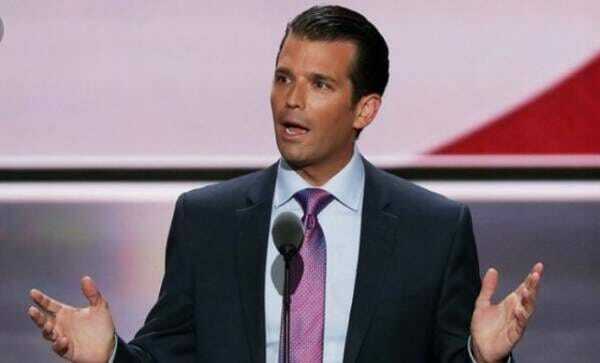 Donald Trump Jr. slammed the “Collusion Truthers” after AG Bill Barr released a summary report on Mueller’s main findings Sunday. Bill Barr released a 4-page letter on Sunday revealing that Mueller and his team of Hillary/Obama donors did not find any evidence that Trump’s camp conspired with Russia during the 2016 election. Mueller also did not find obstruction of justice. Don Jr. sounded off in a social media post Sunday. 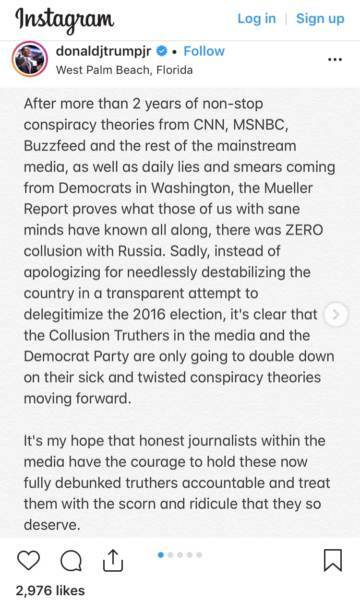 “After more than 2 years of non-stop conspiracy theories from CNN, MSNBC, Buzzfeed and the rest of the mainstream media, as well as daily lies and smears coming from Democrats in Washington, the Mueller report proves what those of us with sane minds have known all along, there was ZERO collusion with Russia. Sadly, instead of apologizing for needlessly destabilizing the country in a transparent attempt to delegitimize the 2016 election, it’s clear that the COLLUSION TRUTHERS in the media and the Democrat Party are only going to double down on their sick and twisted conspiracy theories moving forward,” Don Jr. wrote. “It’s my hope that honest journalists within the media have the courage to hold these now fully debunked truthers accountable and treat them with the scorn and ridicule that they so deserve,” he added. Don Jr. is right — Mueller’s report will not stop the Democrats from continuing to pursue Trump and his family and associates with further investigations. Bill Barr stated in his summary that although Mueller found no crimes committed by Trump and his campaign, House Judiciary Chairman Nadler claimed it also didn’t exonerate Trump. The harassment of President Trump is far from over — Schiff, Maxine Waters, Nadler and the Commie prosecutors up at the SDNY will continue to investigate Trump.